We dispose apartments near the complex, ask if you are interested. The complex consists of eight blocks with a total of 88 apartments, surrounded by gardens and trees. Featuring classic-style interiors, the rooms come with a flat-screen TV and wardrobe. The private bathrooms include a hairdryer. Guests can cook their meals in the kitchenette, which comes complete with a dining area. 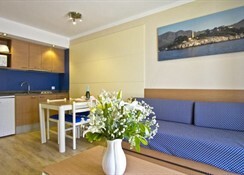 Various cafes and restaurants are located 500 meters from the property. The distance to Gorkogo Park is 2.5 km from Aparthotel Flora. Kharkov Train Station is located 3 km from the hotel, and Kharkov International Airport is 15 km away. Food, drink and entertainment: The Flora Aparthotel has a bar, restaurant, Italian a la carte restaurant, and a snack bar open to the terrace. There is a palm lined promenade nearby with a marina, shops, boutiques, cafes, bars, restaurants and nightlife. Sports, games and activities: The hotel has a large swimming pool with terraces as well as professional animation, a playground, day care, and games room. There is a selection of watersport activities available on the beaches. Additional: 24 hour reception, bookings for events and excursions, rental cars and bicycles, Internet service, free Wi-Fi in the hall, safe box, dining halls for events or conferences. On-site facilities include a 24 hour reception desk with safety deposit boxes, internet access (local charge), WiFi access in the hall and bicycle/car rental. Dining options include a buffet style restaurant (opened at hotels discretion in low season) and there is a snack bar which opens onto the terrace. There is a large outdoor swimming pool which are surrounded by sun loungers laid out on the sun terrace. For the younger guests there is a playground, kids pool and games room. There is a selection of watersport activities available on the beaches (charged locally). All apartments sleep up to 4 with twin beds and 2 extra beds in the lounge, air-conditioning, bath with shower, kitchenette, lounge area, LCD TV, phone and balcony or terrace.Guests can cook their meals in the kitchenette, which comes complete with a dining area. The Flora Aparthotel features one bedroom apartments that can each accommodate 4 people equipped with everything needed for a pleasant holiday. Room amenities include air conditioning and heating, fully equipped kitchen, LCD Satellite TV (full HD), telephone, safe box, and Internet access. The one bedroom apartment sleeps up to four and have a separate twin room, a living area with sofa beds, kitchenette (mini oven, fridge and two cooking rings), telephone, satellite TV, heating, safety deposit boxes (for hire), private bathroom and balcony or terrace. The hotel is positioned approximately 100 metres from a sanday beach and there is a palm lined promenade nearby with a marina, shops, boutiques, cafes, bars, restaurants and nightlife. 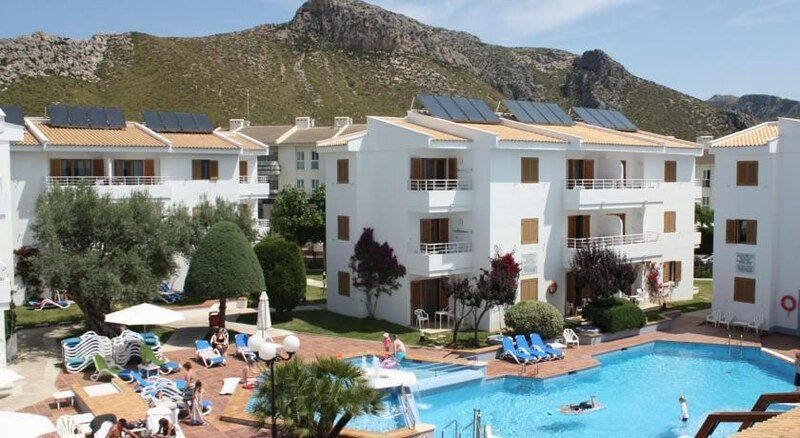 Puerto Pollensa is located approximately 60 km from the airport.